This year, please help us support the Phillips County Museum and Historical Society. 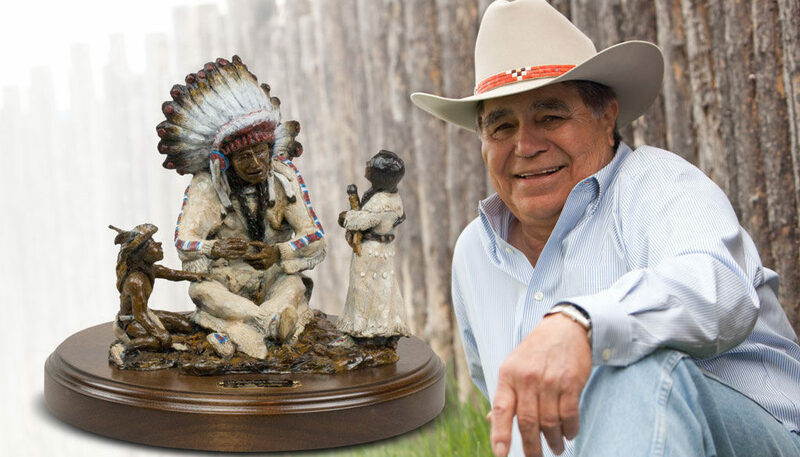 Just invest in the new Jay Contway bronze – Grandfather’s Wisdom and $325 of the proceeds will go to The Jay and Lynn Contway Scholarship Fund for the benefit of the Phillips County Museum and Historical Society. There is much more to Grandfather’s Wisdom then a well-designed bronze sculpture. It represents all that Jay was given by the elders in his life. Pat Contway taught his son Jay by example—work hard, take care of family, appreciate what you have been given, and keep your word. A man Jay refers to as “The Old Indian” had a profound influence on his life. Isadore Ellery took Jay to work alongside him on ranches from the Canadian border to south of Malta, Montana when he was just a young boy. He treated Jay as an adult, imparting the wisdom and truths that he had learned in his long lifetime. In turn, Jay has passed on his own wisdom to the generation that is following him—stories, explanations, directions, and tricks of the trade are freely given to young people who care to listen. In the beginning, Jay wanted a model to sit for him for this sculpture. In the end, he created it from his own memories, thoughts, and vision from what he knew and felt. A portion of the proceeds from this sculpture will go to The Jay & Lynn Contway Scholarship Fund for the benefit of the Phillips County Museum and Historical Society. It is for the youth of the community that shaped Jay and made him the man,and the artist he is today. Contact us here to place your order and help us help our friends at the Phillips County Museum, thank you!